How to manually set/change the location of a record in the Fulcrum for Android app. To do this you will want to have your record opened in the record editor. Then select the set location icon (looks like a crosshair) in the right side of the upper menu bar. Additionally, if you know the coordinates you wish to set the record to you can tap on the coordinates at the bottom of the screen to manually enter in the coordinates. 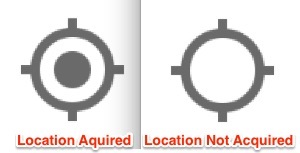 You can tell if the location data has been provided to Fulcrum by looking at the crosshair icon. If there is a solid dot in the middle then Fulcrum has received location data from the device. If there is no dot, then the location data has not been received.